Striped Bass are the most popular game fish in the northeast, and the opportunities for striped bass fishing charters here on Cape Cod are widely regarded as some of the best. Weighing up 60+ pounds, “Stripers” are extremely powerful fish and provide a great battle on the light spinning gear that we use aboard the Dragonfly. Bluefish often mix in with the schools of Striped Bass. These toothy predators weigh up to 20 pounds and also provide an incredible battle. Popular fishing methods include casting top water and subsurface lures, drifting live baits and vertical jigging with a variety of metal and epoxy jigs. The tackle locker on board is filled with everything you will need for a successful trip. 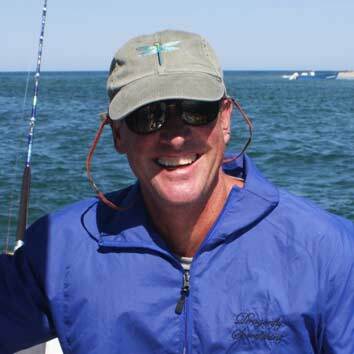 Decades of experience fishing Cape Cod waters enable me to put you on the best fishing possible. Favorite Striper fishing spots include the flats of Cape Cod Bay and Billingsgate Shoals in May and early June, the “rips” in the waters off Monomoy Island in late June and early July and the coastal waters off Chatham, Orleans and Eastham July through October.